This is time for regeneration. This Moon brings an opportunity to appreciate the power of regeneration as the old season is shed and we begin the slow change, contemplation and preparation for the return of a new season of growth. This Moon will host the Winter Equinox, celebrated as Yule. In pagan traditions Yule represents the birth and return of the light of the world. This is evidenced as the longest night of the year, the Winter Solstice, passes, ushering in a gradual increase in daylight hours. Literally… Light withstands Darkness, and in so doing, puts to rest our primeval fears of eternal unbroken darkness with the promise of a return to the longer daylight hours that are so very necessary to the cycle of life and growth. Whether you know this as The Wolf Moon, The Cold Moon, The Snow Moon, The Elder Moon, The Spiral Moon, or The Hunting Moon, you will see this moon as a transition of rulership from the Cailleach (The Veiled Woman) an aspect of the old goddess to, ultimately, become the Spring Maiden in the aspect of Persephone or Kore, or any of the other goddesses of Spring. To be sure, this is not a swift transition. 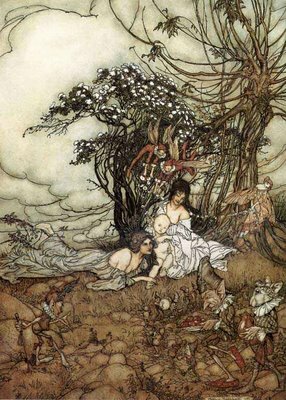 The deep slumber of Winter is still very much upon the land and the sleeping Winter Crone will not complete her regenerative trasformation to wake as the fertile Spring Maiden until the time of the Vernal Equinox, but…. the return of the light is the first step in the successful completion of this transformation. Gradual or not, the world over this transformation is good cause for celebration. Winter’s Crone governs the time of letting go manifested by the seed falling from the mother plant. And as the seed falls… the transition to the birth of many solar saviors from dying gods celebrated at the end of December is completed. These saviors include Osiris, Adonis, Helios, Mithras, Jesus, Balder, Frey, and Baal and this birth confers upon these deities similar titles such as “The Light of the World”, “The Sun of Righteousness”, and “The Undefeated Sun”. The festival of Christmas is but one wonderful example of the amalgam of many religious traditions both ancient and modern and reflects the influences of Pagan, Christian, Mithriac, Jewish, and Zoroastrian beliefs. The general consensus is pretty much that all the work of buttoning things down for winter is done and that makes this “Miller Time”… well… cosmically speaking I guess it would be more like “Mead Time”… but… you get the Idea, doncha? So here’s what I want you to do… deck the halls, hang the holly, and fire up the phonograph. This should pretty much set the stage for a spirited celebration of all things Solstice. This is a time for Renewal. In the calendar system we have provided as an example, the first new moon following October 31st is often known as the Spiral Moon to reflect the spiral path known to all spiritual journeyers. This moon will contain the Winter Solstice and will convey the energy of slow change, contemplative meditation and preparation for the re-birth of light as the days begin to lengthen after the Solstice. In the Celtic Tree Calendar the moon containing the winter solstice is Ruis (Elder) which runs from November 25th to December 23rd. The Runic Calendar of Nordic traditions, (which is governed by half months rather than full months), divides this moon of the year by Jara (Year) from December 13th through December 27th, and Eoh (Yew Tree) from December 28th through January 12th. The Goddess Calendar names this moon of the year after Astraea and runs from November 28th through December 25th. This is a time for renewal, reaffirmation, and re-dedication. The moon of the winter solstice brings an opportunity to appreciate the return of light to the winter darkened world, and with it the slow change of contemplation and preparation for the re-birth of spring. This Moon will also bring the Winter Equinox, celebrated as Yule. In pagan traditions Yule represents the birth and return of the light of the world as from the longest night of the Winter Solstice there comes a gradual lengthening of the days and shortening of the darkness. Whether you know this as The Wolf Moon, The Snow Moon, The Elder Moon, or The Spiral Moon, you will see the transition of rulership from the Cailleach (The Veiled Woman) an aspect of the old goddess. She governs the time of letting go manifested by the seed falling from the mother plant. As the seed falls the transition to the birth of many solar saviors and dying gods celebrated at the end of December is completed. These saviors include Osiris, Adonis, Helios, Mithras, Jesus, Balder, Frey, and Baal and this birth confers upon these deities similar titles such as The Light of the World, The Sun of Righteousness, and The Undefeated Sun. The festival of Christmas is a wonderful example of the amalgam of many religious traditions both ancient and modern and reflects the influences of Pagan, Christian, Mithriac, Jewish, and Zoroastrian beliefs. So, with all that information to guide you, think of this moon as the purist visionary beginning of your own personal year and observe it with things that reflect the renewal inherent new beginnings. Let’s plunge once again into the world of Celtic and Vedic parallelisms, on a previous post I shared the deep roots regarding Gods and Goddesses, but how about Places of Worship? 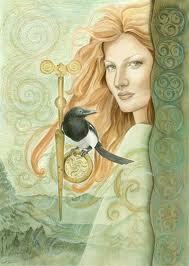 Some of the most auspicious places of worship for the Celtic and Vedic peoples were rivers. As already mentioned the Celtic Goddess Danu is particularly associated with rivers, she was the “divine waters” falling from heaven. From these waters the great Celtic river, once known as Danuvius, presently known as the Danube, was created. Many rivers in Europe still owe their current name to their associations with the Goddess Danu, such as the Rhone. In both Celtic and Vedic cultures offerings were often placed in rivers and those of the Celts were especially elaborate. The Celts would often offer much of their riches and treasures, sometimes approximately 25% of a tribe’s economy would be given to the Gods at any one time. In the falling of the Danu river we find a parallel to Ganga, Goddess of one of the most holy of rivers in India today, the Ganges. In Puranic mythology the Goddess Ganga’s fall to earth was broken by the matted locks of Shiva (known as Rudra in the Vedas), who then released her to fall on the earth. The river which is venerated in the Rig Veda is that of the Sarasvati. Like Danu and Ganga, Sarasvati is the name of a Goddess, as well as a river. However the Sarasvati river is thought to have dried up and it is from that time the Ganges has fulfilled her river role. 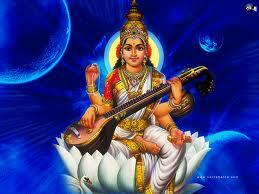 The name Saraswati came from “saras” (meaning “flow”) and “wati” (meaning “a woman”). So, Saraswati is symbol of knowledge; its flow (or growth) is like a river and knowledge is supremely alluring, like a beautiful woman. Some astounding ancient structures to be found in the Eurpoean lands of the Celts and in India are those of Dolmens. A dolmen is a shallow chamber that is composed of tall vertical upright stones, forming the walls, and a horizontal stone resting across the top to form a roof. Similar to what is found at Stonehenge, though on a much smaller scale. A feature found in some dolmens in both Europe and India is a small single hole in the back of these stone chambers. What the purpose of these small holes is remains unknown, as does the purpose of the dolmens. Though most interpretations link these holes either with birth or death. Most Celtic researchers seem to agree that these structures were created by a Megalithic people prior to Celtic culture, about whom little is known for certainty. Is it possible that these Megalithic people had contact with Indian culture long before the Celts and is this why these constructions are to be found in both eastern and western lands? especially sacred spaces (see inf. on the Sleshmantaka Forest in”The Horned God in India and Europe” article). A selection of Vedic texts written after the four main Samhitas (the Rig, Sama, Yajur and Artharva Vedas) are the Aranyakas, meaning ‘forest treatise’. Indicating that these were composed in the reclusive depths of the forests.